You've found it—the perfect conference to network with industry peers and take a deep dive into your field. The only problem? The conference is happening in 2 days, and tickets are sold out. Today, there are enough great UX design and content strategy conferences to fill an annual calendar. But it's hard to attend them if you don't know they're happening until they've started trending on Twitter. To avoid FOMO (or worse, actually missing out), bookmark this list of great content strategy and UX design conferences coming up in 2018 . Psst—is something missing? Hit us up on Twitter to get it on the list! 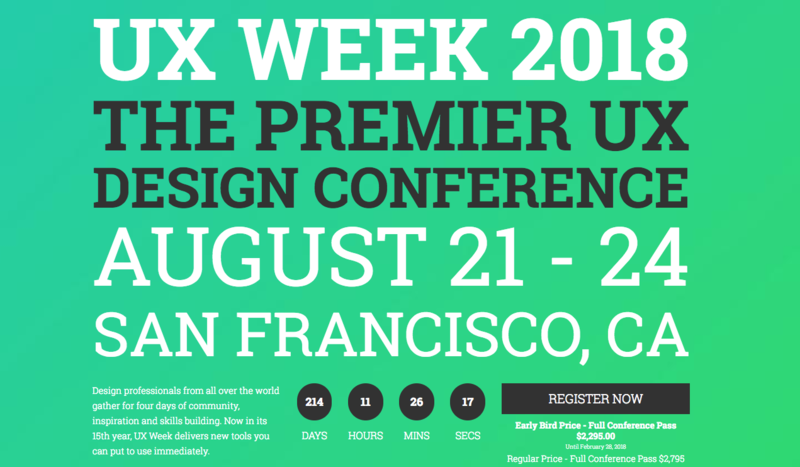 UPDATE: We’ve added The UX Conference to the list of conferences in September. Nielsen Norman Group, the evidence-based UX research, consulting, and training team, kicks off 2018 with an immersive conference in Singapore. From January 29 to February 2, you can attend courses on topics like measuring user experience and journey mapping. Bonus points for the ability to get a UX certification afterward. Can't make these dates? Nielsen Norman Group hosts the UX Conference in different cities a few times a year. ConveyUX goes down from February 27 to March 1 in Seattle. The conference is packed with excellent speakers (the 2018 lineup includes Kai Haley from Google, Elizabeth Laraki from Facebook, Dan Brown from EightShapes, and lots more). So far, the agenda is incredibly diverse, covering everything from quantifying user journeys to designing a human conversation. UXCopenhagen, an annual conference in Denmark, is a 2-day conference for "top-notch professionals working in and around user experience design." This is where to go if you want to hear about new trends and practices at both established companies and startups—just ask the always-entertaining Mike Monteiro who co-founded Mule Design and is slated to speak. This year, the conference's theme is "ethics and the role of the user experience designer," with notable talks on designing for good, accessibility, an AI ethics. As mentioned, this conference makes the rounds a few times each year. From February 25 to March 2, 6 days of in-depth, full-day courses are happening in Los Angeles. Each NN/g conference has a slightly different lineup, and this one includes workshops on becoming a UX strategist and writing compelling digital copy. In previous years, companies like Walmart Labs, BBC, Salesforce, and IBM attended, so you'll also be in great company for networking and peer learning. From March 21 to 25 in Chicago, "information architects and experiences designers will converge"—which is also the year's theme. This will be the 19th year for the conference on creating and managing information spaces, and with former speakers like Abby Covert (Etsy) and Jared Spool, you can guarantee sessions will be loaded with actionable information from the experts. Still curious about what goes on at IASummit? You can peek at all of 2017's slide decks and posters on Medium. This time in London, NN/g's UXConference takes place from March 17 to 23. It follows the same full-day workshop agenda as previous cities, but also includes sessions on managing user experience strategy, turning data into user-centered design, and content strategy. Now in its third year, Smashing Conference blends the best of design and strategy. The spring conference, happening April 17 and 18, will "explore strategies for breaking out: leaving behind generic designs and smelly code base." Expect fantastic sessions from 13 featured speakers—including the great Rachel Andrew. An Event Apart (AEA) will be holding 6 events in different US cities throughout 2018. The first will take place the first week of April in Seattle. Join speakers like content strategist Kristina Halvorson and others for 3 days of design, code, and content! This time in Washington, DC, NN/g's UXConference takes place from April 14 to 20. This conference in London is May 23-35. UX London brings “engaging industry leaders from around the world to pstresent a combination of inspirational talks and lively, hands-on workshops.” The conference has a unique approach to presenting content in that each day of the conference focuses on a specific area of UX. 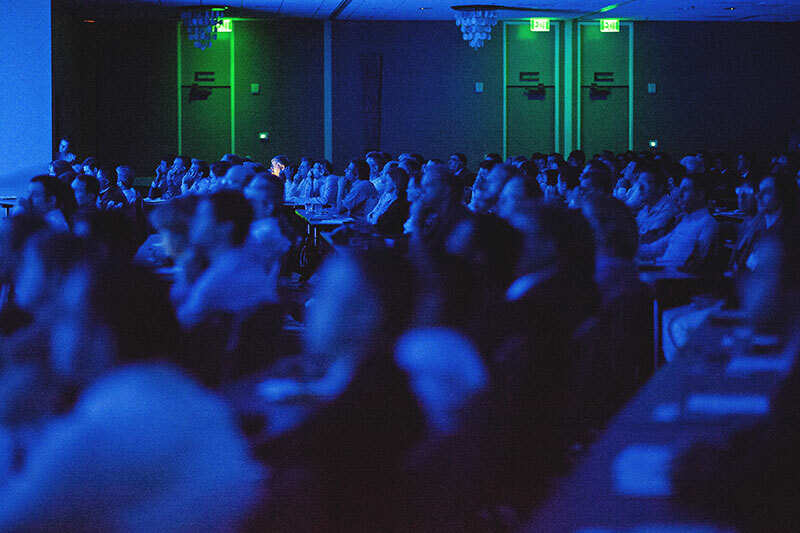 Confab is the (now unified) conference for all things content, content strategy, and UX. “Confab is the event for people who design, create, and manage content. From UX to storytelling, accessibility to structure, Confab brings together those who are committed to making content useful and usable.” This year’s conference takes place May 21-23 in Minneapolis, MN. An Event Apart (AEA) will be holding 6 events in different US cities throughout 2018. The second will take place June 25-27 in Boston and will feature speakers like Val Head and Jen Simmons. The Design & Content Conference will be back in Vancouver for their FOURTH year on July 25-27, 2018. It’s a conference where “designers and content strategists team up. Hear from industry leaders about crafting experiences and telling stories that shape the future of the web.” It’s a day of workshops and two days of talks. The third of AEA’s 6 events will be held in Washington, DC July 30 – Aug 1. The lineup is still in flux, but you can expect some of the same speakers from earlier AEA events plus heavy hitters in the UX industry like Jeffery Zeldman and Gerry McGovern. 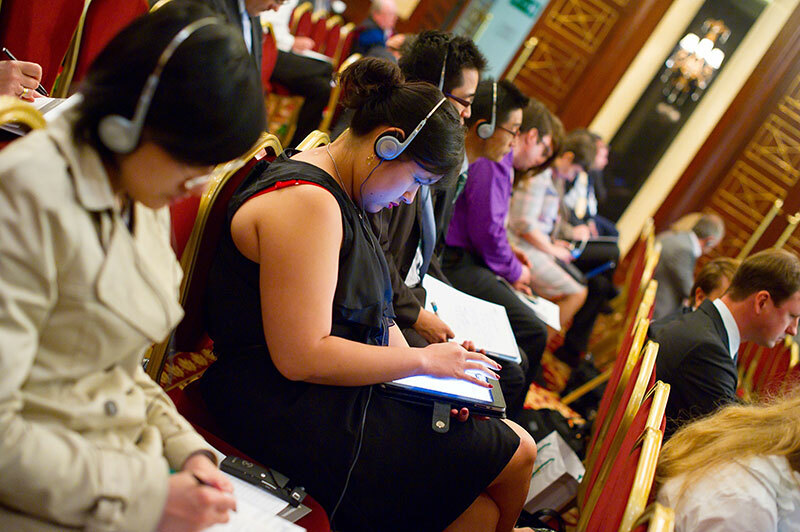 The fourth of AEA’s 6 events will be held in Chicago July 30 – Aug 1. The lineup isn’t completely set yet, but you can expect some of the same speakers from earlier AEA events. The theme of the UX Conference on September 7th 2018 in London is collaboration between designers and researchers in User Experience design. Is UX research underrated? Want to learn how to convince your stakeholders to invest into it? When is it just enough research? Join them and find out! The Content Strategy Innovation Summit will take place September 13-14 in San Francisco. You’ll be able to “learn from more than 25 industry experts and exchange ideas through deep-dive discussions. Innovate your content strategy and take away industry best practices from the lessons offered by leading organizations…” like Uber, Visa, and Disney. “The EuroIA Summit is the leading Information Architecture (IA) and User Experience (UX) conference for Europe. It is organized by a team of volunteers every year in September, in a different European city… It is an international event that is focused on the growing fields of Information Architecture (IA) and User Experience (UX).” There’s no specific date set yet (other than it’ll be in September like always), so keep an eye on their website and Twitter. Midwest UX is a unique conference in that they aim to be “affordable and approachable for other designers who many not have resources to make it to the pricier national and international conferences.” If you’re looking for a conference somewhere in the US other than San Francisco, Seattle, or Washington, DC, this is the UX conference for you. “The WUC is Austria’s premier user experience design conference. Two days of conference presentations provide practical skills to take away, inspire you for your next projects, stretch your knowledge or show how someone has tackled a problem just like ones you’re facing.” If you’re in Europe, this is a conference worth checking out. The fifth of AEA’s 6 events will be held in Orlando October 8-10. The lineup isn’t completely set yet, but you can expect some of the same speakers from earlier AEA events plus InVision’s own Aarron Walter! The proudly Canadian conference CanUX (pronounced Canucks, like the hockey team) will be “a 4-day showcase of modern experience design trends featuring hands-on workshops and a world-class mix of amazing presentations.” Check it out the first weekend of November in Ottawa. The final AEA event of 2018 will take place in San Francisco. December 10-12 is a great time to visit the Bay Area, and you’ll also have the opportunity to hear from speakers like Rachel Andrew, Derek Featherstone, Val Head, Gerry McGovern, Jen Simmons, Eric Meyer, and Jeffrey Zeldman. Did you see the UX design trends for 2018?